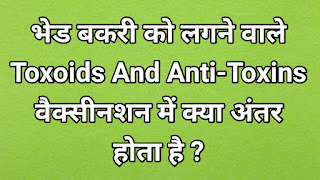 Home Goat Diseases Hindi Difference Between ANTI-TOXINS and TOXOIDS in Goat Vaccination. Difference Between ANTI-TOXINS and TOXOIDS in Goat Vaccination. ANTI-TOXINS and TOXOIDS in Goat Vaccination. Effective Tick , Mites and Fleas repellent For Goat, Cow and Dog. What Is Anti-Toxins Vaccine For Goat. What Is Toxoids Vaccine For Goat.